The whole fight is over $5.7 billion the President wants in the budget, so that his administration can install more border barrier in targeted locations. The public’s opinion of the wall and the shutdown is largely determined by what news channels they watch and who they follow on social media. This is both an explanation of how we got here, and the reason why it is going to be so hard to get out. The political representatives on both sides have little incentive to compromise and zero incentive to give in. Both parties are playing to their respective bases, with firm eyes on the 2020 election. Any weakness shown here would follow them through the next general election. Make no mistake; that is what this is about. The left is painting the barrier on the Southern border as immoral, while the right draws it as a moral imperative. It will be difficult to reconcile those two opposite views. Regardless of where you stand on the morality or the effectiveness of the wall, the money is inconsequential in the scheme of the federal budget. The President is asking for ~0.1% of the 2019 budget. The farm bill passed late last year was $867 billion. We spend $6 billion on Medicare every three days and $6 billion on the military every four days. I think the federal government spends too much on just about everything, but to say this request is unreasonable for monetary reasons is disingenuous. As with much in our politics these days, there is no incentive for either side to give in to the other, because the respective bases are almost entirely in sync on who is to blame. This poll will have to crack in order for either side to give in. Shutdowns have been a tool employed by both Republicans and Democrats, in both good and bad economic times. Stocks generally show no discernible trend during a shutdown. Chart via LPL Financial Research. 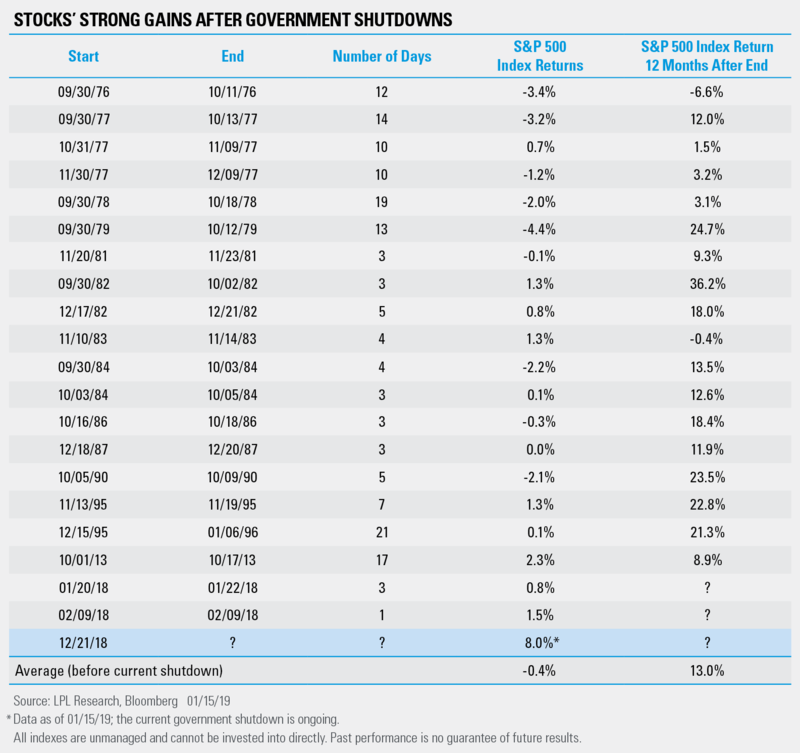 However, since 1976 stocks have historically performed well 12 months out from a government shutdown, with an average return of 13%. Chart via LPL Financial Research. From a market perspective, stocks tend to ignore shutdowns when they are happening, and perform well after they are resolved. However, this one is already the longest in history and there is not much indication that a deal will be reached imminently. We are also in the later stages of an economic expansion with a market that has proven vulnerable over the last few months. These factors could provide a downside catalyst should this shutdown persist for several more weeks or months. With growth already expected to decelerate from 2018, a shutdown could further that decline and lead to sub 2% growth for the year. While this shutdown is a real-life challenge for those thousands of government families not getting paid, they collectively make up less than 1% of the workforce and it will have a small direct impact on the broader economy. 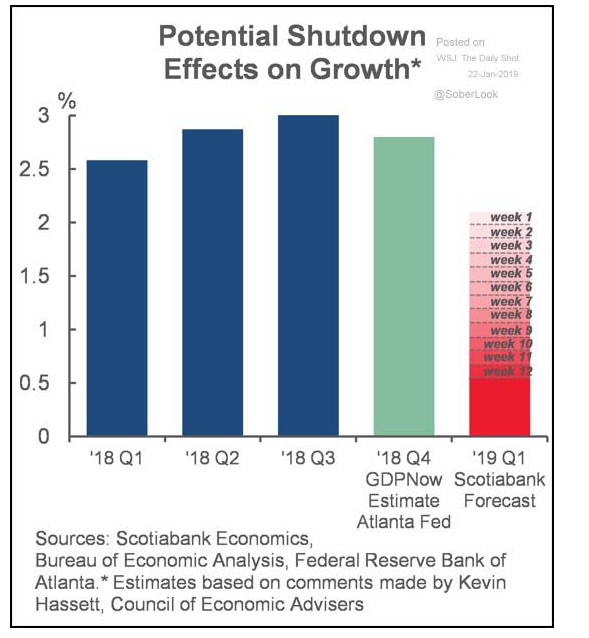 However, according to Scotiabank, each week that the government is shutdown could clip about 0.1% off 2019 GDP. That is largely due to an inertia effect and not a direct impact. It is because an estimated 4 million contractors will also be out of work, small businesses can’t get loans, companies can’t go public, and the ‘government adjacent’ businesses (think the deli next to the IRS building for example) will lose money as a result of a longer shutdown. These challenges slow down momentum in the economy and it can take some time to ramp back up again. 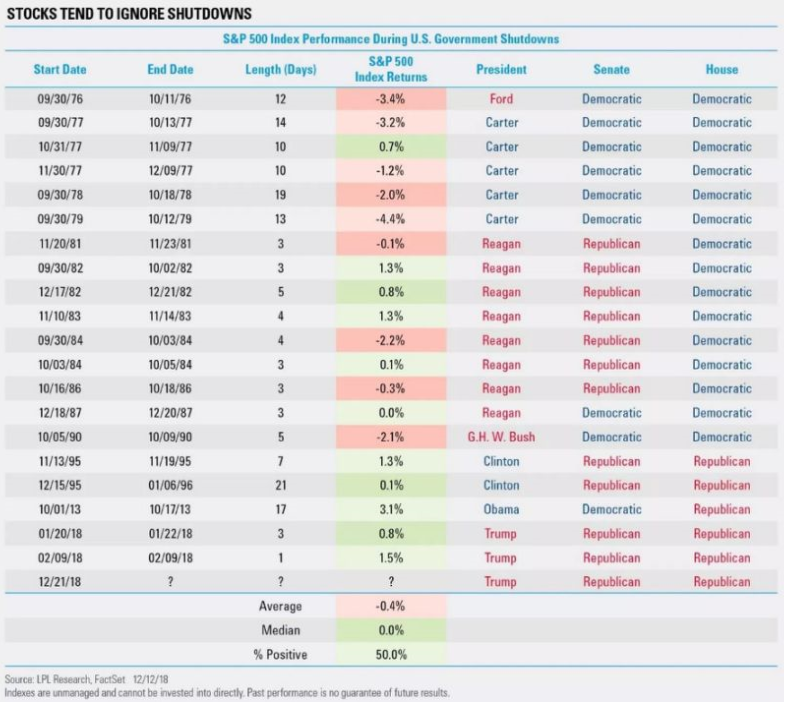 Short shutdowns are generally not a big deal economically, but one that could conceivably last for an entire quarter will certainly be a non-trivial event.